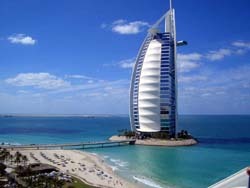 For our 5 hostels in Dubai, we show actual room availability. Dubai is a true paradise for shoppers, because you will not find such number of markets in any other emirate. Trading outlets and shops occupy a whole quarter that is called Deira. Here are located a fruit market Fruit Souk, a fish market Fish Market, trading rows with jewelry Gold Souk and a spice market Spice Souk. Please do not hesitate to call us using the number specified below, if you wish to book a hostel or a guest house in Dubai. OrangeSmile.com provides 5 inexpensive and affordable hostels in Dubai, United Arab Emirates - often with hot deals and last minute discounts.